Your fastest way to learn CSSLP. Why wait? Some 80% of all security breaches are application-related, equating to more than 226 million records being disclosed and fines reaching astronomical amounts. Firebrand Training and (ISC)2 provide a solution that establishes industry standards and instils best practices in developing, managing and maintaining software security. This accelerated CSSLP (Certified Secure Software Lifecycle Professional) course provides IT professionals with a fully-immersed, zero-distraction, all-inclusive CSSLP training experience. Our CSSLP course encompasses all domains of the (ISC)2 CSSLP CBK, all meals, and accommodation. The professionals who manage these stakeholders. On this course, you'll prepare for and sit the CSSLP exam, covered by your Certification Guarantee. The CSSLP certification is governed by the International Information Systems Security Certifications Consortium (ISC)2. The key advantage of authorised (ISC)2 Institute Training is fundamental: The institute's goal is to provide an extensive overview of the Common Body of Knowledge (CBK), the compendium of practices and standards compiled and continually updated by (ISC)2 and used as the basis for the CSSLP exam. 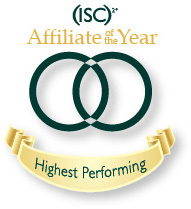 Firebrand Training has been named as “Highest Performing Affiliate of the Year – EMEA” by (ISC)2. The major security association helps companies recognise organisations and individuals who are knowledgeable in security through the CISSP, CSSLP and SSCP training. (ISC)2 is an international, non-profit membership association built for security professionals. When you certify, you’ll become a member of (ISC)2. As a member, you’ll join a global network of 125,000+ and get access to an array of exclusive resources, tools and peer-to-peer networking opportunities, conference and event discounts. Become a member by earning one of (ISC)2’s gold standard certifications. Contact us to find out more. Are guaranteed to adhere to stringent technical pre-screening practices - Candidates that do not have the necessary work and education experience my be subject to decertification as per the CSSLP "Code of Ethics"
On this accelerated course, you'll prepare for and sit your CSSLP exam at the Firebrand Training Centre, covered by your Certification Guarantee. "Enjoyed my course. gave me the opportunity to immerse myself and learn away from work. Facility and instructor were exceptional"
"Amazing opportunity to develop new set of skills in a professional environment. Excellent instructors, great and diverse colleagues from different industries and really cool facilities. Totally recommend." "I found that the whole setup of Firebrand is conducive to an excellent learning experience." "The Firebrand staff were always helpful and courteous. The facilities were top notch and the lecturer was knowledgeable and experienced. I will be using again. " "Quite pleased with the results and the knowledge I've gained in such a short period of time." "Firebrand is a prepared learning environment with great tutors and staff"
"Firebrand training provides a relaxed intense training approach. You learn so much in such a short time but with minimum stress"
"BRILLIANT EXPERIENCE TO HELP FACILITATE YOUR CAREER GROWTH"
"VERY NICE POLITE, PROFESSIONAL MANAGER AND STAFF WITH GOOD FACILITIES." "nice and friendly environment where you can really focus on the course." "well organised and good learning environment. good instructor"
"staff and instructor - 5 stars"
"A pampered intense week of learning, provided by a very well organised training company "
"I felt that Firebrand were excellent from start to finish." "Our teacher provided a huge amount of additional value based on his personal experience which was very interesting and beneficial- many thanks!" "This is a great way to learn, good facilities and excellent instruction, with lovely Firebrand Team! Thank you." "Tremendous learning experience. From zero to hero. " "Great learning environment that allows you to fully immerse yourself in the course and maximise your time away. I found the instructor invaluable at helping me become a CISSP." "Fantastic instruction and simply the perfect learning environment that allows you to fully immerse yourself into your training." "Great environment with no distractions and a perfect teacher." "Excellent and very knowledgeable instructor. Course was educational and fit for purpose food and facilities were good. Accommodation could use some work. Very good experience overall - will use Firebrand again." "A truly intensive and highly rewarding learning experience." "The CISSP course with the instructor was an extremely insightful week. Having 20 years experience in IT, I have barley "slowed" down enough to refresh the knowledge I have organically obtained. The instructor's knowledge and real life experiences, advice and direction are priceless. I feel rich in what I know and I have questioned what I don't with fresh eyes and I am truly grateful for this experience. He is great teacher and a lovely person Thank you." "I knew within 30 mins that i would pass the exam 6 days later based on my instructors introduction." "Very valuable week, very well prepared and delivery training which helped me to achieve my goals. The instructor is very good and professional. He masters all the subject and domains of the CISSP CBK." "Fastest and more secure path to achieve your certification. " "Fantastic experience. Our instructor was really knowledgeable v friendly. He clearly helped us to focus on whats important and provided us with invaluable advice." "Fantastic experience. Our instructor was really knowledgeable. He clearly helped us to focus on whats important and provided us with invaluable advice." "This course is an intensive boot camp loaded with informative content in relation to the CISSP course." "CISSP is a lot to take in. The week @ Firebrand took the information i had and placed into the domains aligned with the test in the domains. All things are covered when you study here." "First CISCO and now CISSP. Firebrand guided me through the certification minefield again." "An excellent course that was delivered with clear and detailed info. Firebrand are the go-to training Company." "Good instructor. Good training Facilities. Poor accommodation." "A terrific boot camp - do some prep before you attend." "Watch the video on the website." "Very intense week , not for the feint-hearted. Altogether i met some great professionals with whom i made good friends which made the course more enjoyable." "Fantastic experience, enjoyed every bit of it." "Really hard work and long days, but that is why I chose Firebrand." "The instructor is very good "
"Intense, challenging, mind-blowing at times, but an excellent way to obtain your certification under the skilled guidance of the tutors and support from the Firebrand staff. " "One of the best training. Very dense program. I didnt loose time in evenings and lunch. Great positive attitude of the team." "Enjoyed the campus feel and think that it adds a good element to allowing you to immerse yourself in the subject and really get to know things to give you every chance of passing the exam by really knowing the material. " "The instructor provides a great learning experience and imports his knowledge with ease in an environment that is conducive to learning. Thoroughly recommended!!" "Long days, hard work but learnt a lot." "This is my third time at Firebrand and each time has been intense but rewarding. Its a great environment to learn in and you will take knowledge back with you that you will find invaluable." "I think the whole experience is extremely well structured. The living environment is comfortable and convenient. The learning environment is light with good environmental controls & appropriate instruction has been on the button irrespective of exam result." "Very intense training which fully immerses you in the subject." "A tough but great way of learning. The immersive nature could only work with great facilities, good food and excellent staff, of which Firebrand has an abundance. " "My Firebrand course proved to be challenging, rewarding and very enjoyable. The group built a comrade and desire to succeed. At the end of the week a great sense of achievement was felt." Quite pleased with the results and the knowledge I've gained in such a short period of time.